Sam "the man" Taylor was a popular jazz and blues tenor saxophonist player in his native America who had an even bigger career in Japan. 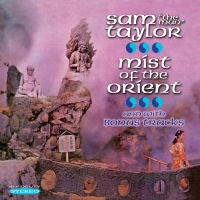 Taylor performed in Japan countless times throughout the 1960s and 1970s and made numerous recordings there including the atmospheric album MIST OF THE ORIENT. MIST had a well-received American issue but has never had a full CD reissue till now. Included are ten bonus tracks from another Sam Taylor album MISTY MOOD, also making their CD debut.